Ever heard that song by George Strait? I hate it. It’s kind of sappy and reminds me of being dragged around to country concerts when I was 11. Not fun. Well, the chair I wanted wasn’t my chair after all. What chair? This $500 masterpiece from Pier 1 Imports. Well, it’s technically $499.95, but $500 is about right. (In all fairness, it was on “sale” for $450 2 weeks ago, and you can get 10% if you want to ruin your credit save money by applying for a Pier 1 Imports credit card!) I wanted it. I begged for it. I considered selling my dog for it. (I’m kidding, I love you Pee Wee!! 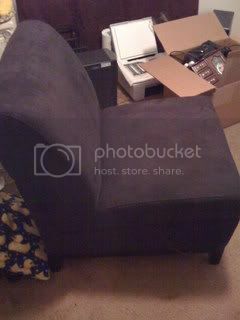 )$500+ for a chair is almost my ENTIRE $550.00 office budget. Instead, I gave up on that dream, and we headed off to Home Goods. And lemme tell ya, they had lots of goods. Including the bestest chair ever! It’s black, huge, and microfiber. Oh, and it has storage under the seat! I plan to put guest linens in there or something Martha Stewartish like that. Oh, why am I kidding myself, I’m going to put random crap in there. There, I said it. Here she is: At $199, it was a deal I could not pass up. My biggest issue with the chair is that it doesn’t have arms, but it is beyond comfy and the price is right. Who needs arms on the chair when I have 2 arms already? How lazy can we be?There was a bunch of other stuff we saw at Home Goods that we liked, but this was the main attraction. I did see a fabulous glass/white iron lamp for $50 that would have matched perfectly with the office theme, but I stopped myself since I technically have a perfectly good lamp I could use. I hate being reasonable. *sigh*But, I digress. The chair from Pier 1 is fabulous, but they also had lots of other stuff that is completely unnecessary, but that makes me want it even more. Why is that? 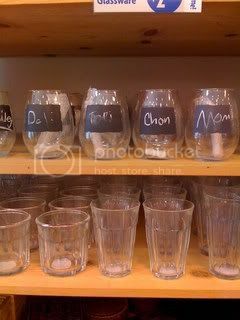 Chalkboard drinking glasses. This will solve the, “Which drink is mine?” dilemma that people sometimes experience. Seeing as how it’s me, Daniel, and the dog, I figured we each knew which glass we drank from. Pee Wee’s is a bowl, and he knows he can’t pick up a glass since he has no thumbs. So, these stayed on the shelf at $4.00 a piece. 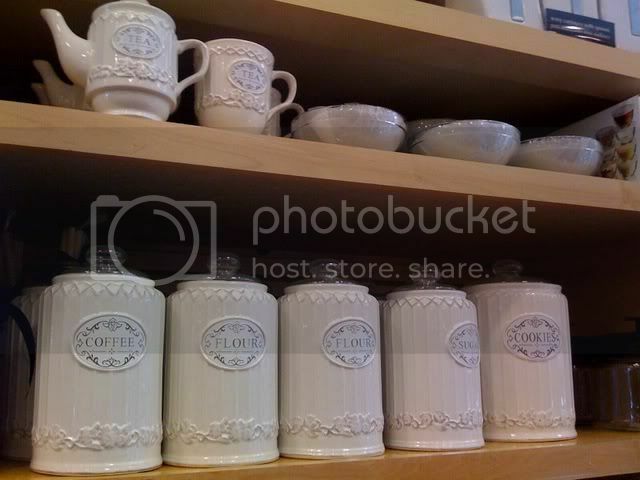 These canisters are gorgeous. I could picture myself putting them in my kitchen in my future mansion home. At $8-$15 each, I didn’t think it was terribly expensive, but Daniel has to burst my bubble by pointing out that we don’t have room in our apartment kitchen for them. I may buy them anyway and store them in a box. Take that Daniel! This table made me want to hop on a flight to somewhere tropical, but not Mexico since I don’t want the pig flu. 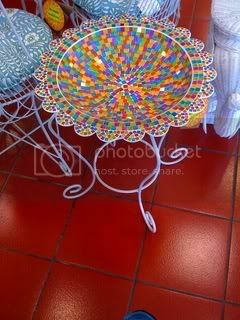 It’s a pretty, bright table that would look great on a deck with white wicker furniture and lots of flowers in bloom. $99What did I buy at Pier 1? I bought this shabby looking magnetic chalkboard for $18. 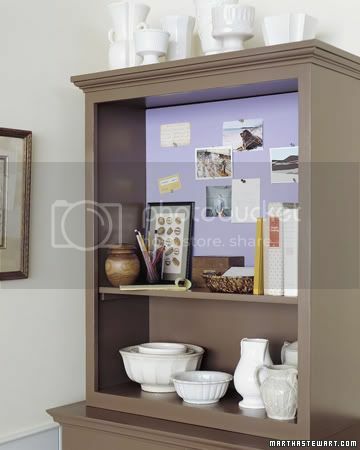 I plan to put this in the bookshelf like this: Or maybe put it on the wall near the table/chair. Don’t know yet.I will say my thirst for a cool chalkboard has finally been quenched. 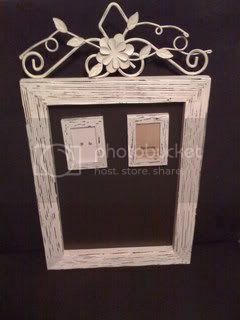 I know chalkboards are outdated, but this cool chalkboard cling from Paper-Source made me become obsessed with them. So happy to have found an affordable, cute, and magnetic chalkboard for my office. Life is good.